Approx 52" high and 32" wide. Very fine quality. Carved and gilt. Possibly New York but very hard to document. 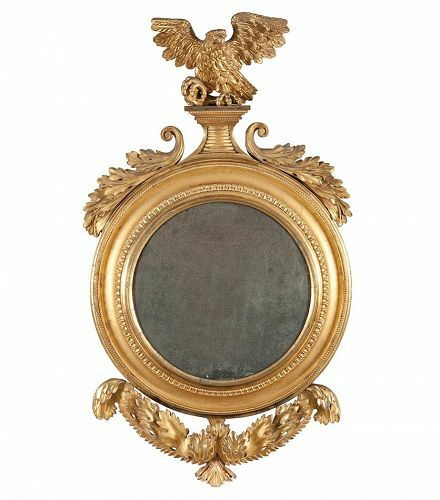 Fine period mirror in a marvelous state of preservation, approx. 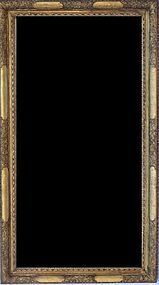 52" x 27"
48" high, 29" wide--all original including mirror plate, backboard, gilding and eglomise panel. Probably New York City. Having old replaced mirror plates, approx. 42" high and 27" wide. 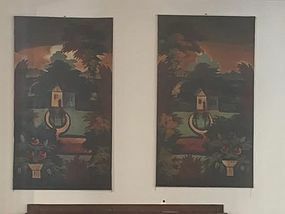 A perfect matched pair of window shades, painted on oil cloth. We mounted these on a stretcher and lined them so they can be displayed as decorative paintings. They were cleaned minimally and would be a great addition to an interior. Each panel measures 58 1/4" x 33 1/4". Approx. 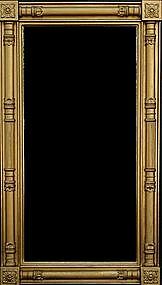 60" x 20.5", George I, Overmantle Mirror, Three part glass mirror with walnut, parcel-gilt, and a pair of later date glass candle arms, circa 1725. 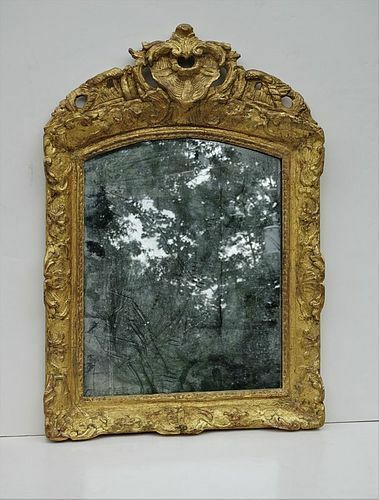 Similar mirror is represented in Schiffer's, "The Mirror Book," #128, Walnut veneer on pine, English, circa 1725, and on display at the Metropolitan Museum of Art. 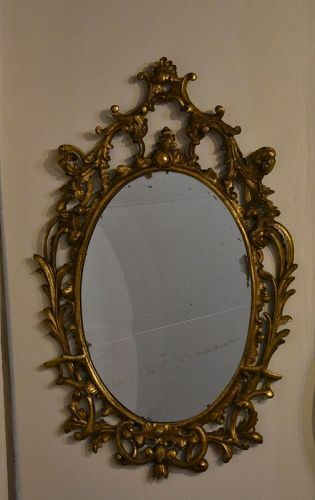 Fine period mirror with what appears to be original glass in desirable oval format. 39" high, 25" wide. 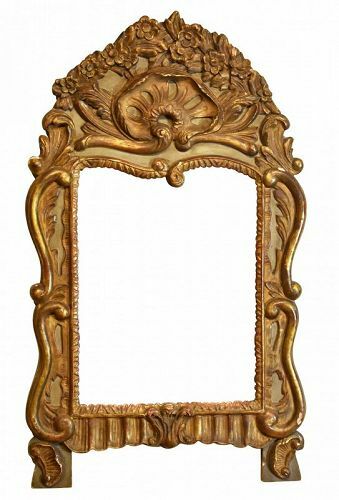 UK/European Gold Leaf Frame Mirror, 18th C.
60" high, 33.5" wide. 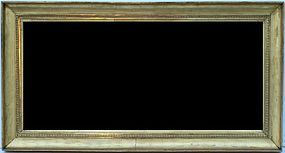 Mostly all original gilding, attributed to Platt, Boston. 40" x 60". 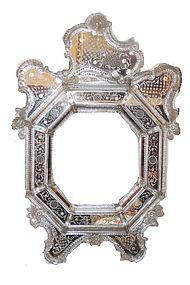 Having etched glass in foliate motif, rosettes, and blown glass adornments. Works well with numerous designs. 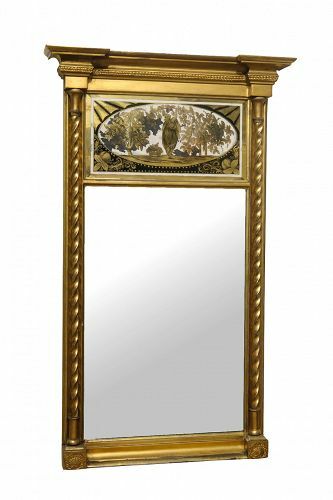 George III Giltwood Mirror with Eglomise Panel,19th C.
40" high, 23" wide, circa 1810. Note original gilding and eglomise panel. Approx. 53" high./ Parcel gilt and with two part glass. Rare model. Two part beveled glass. Approx 35.5"" x 21" original glass with original back. 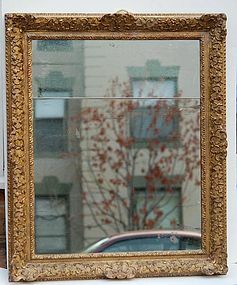 36" x 14" approx dimensions--having original two part mirror plate and original backboards. Good condition. Beautifully carved. 21" 30"